Russ & Daughters Cafe can be booked for a variety of private events including: weddings, cocktail parties, caviar tastings, holiday celebrations, corporate events, family gatherings, business meetings, and birthday dinners. Our 70-seat space can accommodate both seated meals and cocktail-style standing events. For information about hosting an event at Russ & Daughters Cafe, please contact us at cafe@russanddaughters.com. 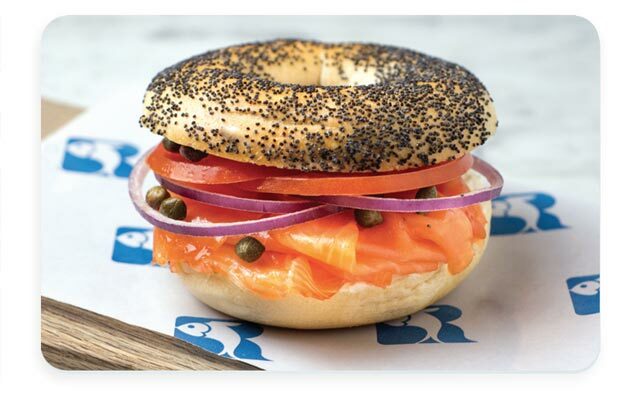 Treat someone special to a meal at Russ & Daughters Cafe — a taste of NYC! There is a minimum value of $25 per gift card. Russ & Daughters Gift Cards purchased after 11/24/18 can be used at all Russ & Daughters locations. Russ & Daughters Gift Cards can be sent digitally via e-mail or shipped.